In November and December we will be rotating exhibits of new work from our gallery artists. This month we will have new work from Jon Jay Cruson, David Randall Tipton and Laurel Bustamante. This is the first time we’ve had the finely painted, delicate and ethereal miniature worlds of Laurel Bustamante. You may have seen her work at the Schneider Museum of Art in their recent exhibit, Exploring Reality. 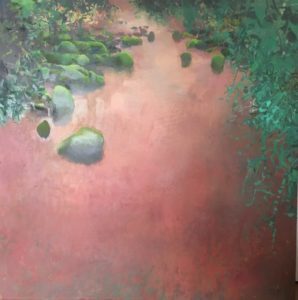 David Randall Tipton and Jon Jay Cruson will be sharing the space with their much larger scale paintings , each artist having a distinctively different spin on the tradition of “landscape”. Born in Sacramento and currently residing in Eugene, OR, Jon Jay Cruson is a true West Coast artist. 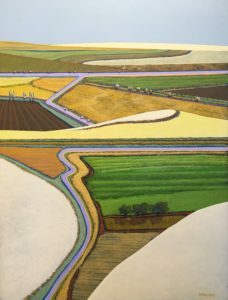 His paintings, stylized shapes, patterns and colors, are the result of much time spent studying the Pacific Northwestern landscape. His work is included in a number of permanent collections including Portland Art Museum, University of Oregon Museum of Art and The Victoria Albert Museum, London, England. Randall David Tipton is a Northwest contemporary landscape painter residing in Lake Oswego, OR. 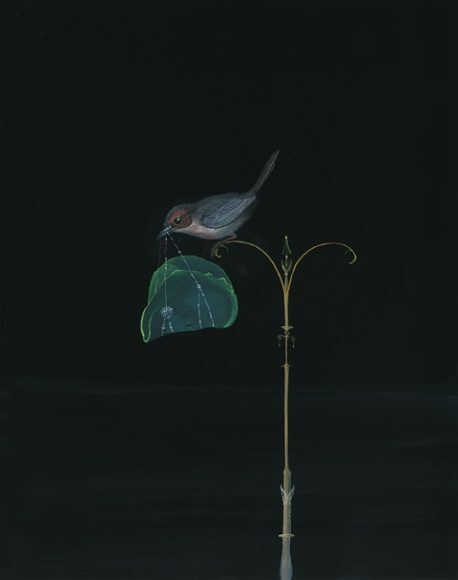 Tipton’s paintings sometimes incorporate studies from plein air but are primarily created in studio working from drawings, photos, hunches and memory, using an experimental approach. Laurel Bustamante (b. 1956, California) studied painting and drawing in the San Francisco Bay area and received her BFA from Southern Oregon University in 1999. 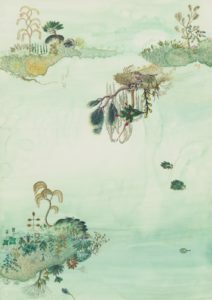 Her work has been exhibited in galleries and museums in the US and abroad. She was awarded the Artist on Location Project residency in Curacao, Netherlands Antilles in 2000 and the Crater Lake National Park Artist Residency in 2001. In 2013, she was a finalist for the Portland Art Museum’s Contemporary Northwest Art Awards. Bustamante was one of eight artists featured in the 2015 Schneider Museum of Art exhibit, “Exploring Reality.” She lives and works in Ashland, Oregon.